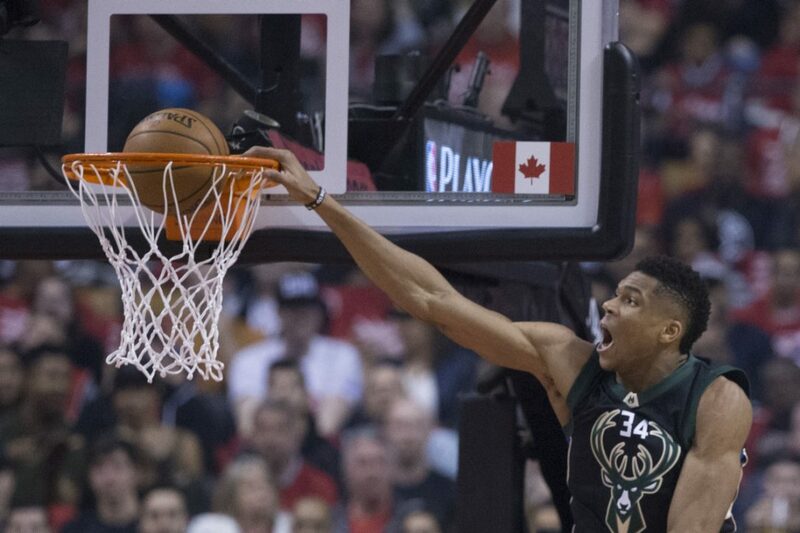 In the first two games of the series between Milwaukee and Toronto in the NBA Playoffs, Giannis Antetokounmpo has only been used in 32.5% of the Bucks ball screen offense. As a team, Milwaukee is averaging 0.93 PPP in their ball screen offense. I'm curious as to why Jason Kidd doesn't use The Greek Freak more often as he is averaging 1.38 PPP in ball screen situations. As I watch film of games 1 & 2, Toronto struggles with match-ups and how to guard Giannis. When he is the ball handler, the Bucks typically have a guard (Brogdon or Dellavedova) setting the screen. Because of Giannis' length and the ability to pick and pop, defenses are unsure how to guard. In the clips below you can see Giannis take advantage of these matchups. When the defense tries to switch, he hesitates and attacks the rim. When they try to "ice" the ball screen, he is too fast for the big to contain on the sideline. If they sit back and guard the paint, he has a great mid-range game to pull up. The Bucks also do a terrific job of spacing the floor when Giannis is the screener. Again, defenses must honor the guard attacking the rim, but this allows Giannis to find a window in the paint. Khris Middleton is always spacing the floor and taking his defender with him. With his shooting ability from outside, the defense is forced to make a choice - guard the 3 or help on the roll man. For was well as the Bucks execute their ball screen offense with The Greek Freak, I'd like to see them do it more often the rest of the playoffs. Giannis' ability to exploit match-ups in the ball screen is incredible and could be the difference maker the rest of the way. I'm interested to see if Jason Kidd makes this adjustment because I don't see the Raptors being able to consistently guard this action.